The five-day retreat immersion program ignites the way and the wisdom of horse into human consciousness to access greater levels of spirituality, connection with self and others, and communion with nature and horse, on a tranquil ranch along the Murray River. At the end of the day enjoy a peaceful walk in the gum trees, wander in the green meadow or swim along the banks of the river. Create a sisterhood with others, or spend time in reflection with the herd. Meals are shared in a spacious and uniquely designed community house. Are you ready to deepen your understanding of your natural gifts and break free of limiting patterns? Are you ready to partner with horse to expand your inner consciousness and knowing so you have more ease and joy? Would you like Horse to guide you to profound insights, changing your life forever? 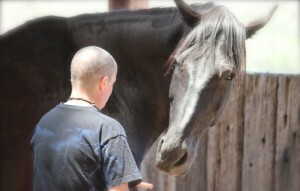 Each day we will engage with and explore consciousness with Horse. Horse will teach us how to be fully present, expanded in our acoustic being, open and receptive to intuition, and connected to one another. Deep transformational Round Pen sessions (and additional sessions/interactions with horse) to bring you to your next level of clarity and personal power. An amazing Archetype Assessment to highlight your natural gifts and how to honor them. Processes to reprogram the brain, thus shifting old patterns of thought into new higher vibrational patterns, attracting new opportunities. Identify (and release) old unproductive agreements so you may move forward in your life. Body centered awareness, movement, and engagement to bring you back home to your inner knowing. Two point bodywork process for self and horse, so you may access deep healing and shifting (for you or your horse) at any time. This year’s retreat style program with horses is both for the seasoned individual or one that is new to the work. The individual who seeks advanced tools will find plenty of resources and processes for their own work with their clients. Click Here to download lodging registration form. After you register, fill this out and send to Jane at Banyandah. *This is a limited space program. To reserve your spot, register early! This one day highly informative and experiential program brings Horse and humans together for deep learning, connection, and transformation. 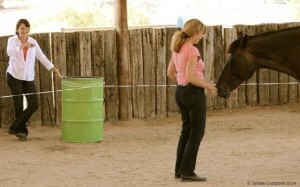 During the day you will be led in exercises to deepen your awareness through learning the “way of Horse.” In addition, Kathy will facilitate an equine facilitated round pen experience with an individual while providing learning and integration for all attendees. Learn about how horses teach humans about presence and awareness. Expand your ability to connect with horse, mother earth and others. Experience an expanded sense of being and deeper connection to your body wisdom. A strong sense of community with like-minded individuals who love horses, all animals and mother earth. Worksheets and charts to use for future reference. Tools and processes to add to your every day life or work with others. Resources of other facilitators or training programs you can attend to continue on your path with Horse. A new respect and way to honor Horse. New connections with others who share the same values. *If you wish to register with check or cash contact Lisa directly at: 0431572555 or Send an email. "I would have never expected the most awesome connection I have had thus far in my life (on a conscious level) would have been with a horse! When I was present the horse was with me step for step, when my mind wandered from the present, the horse was gone. This experience helped me understand that if I make a conscious effort to be present in my body I am then in control of the direction I take and the way I interact with the environment around me. Many thanks." "Thank you very much for a powerful and healing experience. It was magnificent. I strive to never live small again. I did not realize to what extent I was living in a shelled-over manner. I have come out of is as a leader among horses with their respect. This will translate into my everyday life. Thank you." "Through intuitive support and guidance from both Kathy and horse, I experienced incredible growth of spirit and self as I embraced and connected with my true Archetype. Connection with self, connection with horse, connection with spirit and connection with group. Kathy Pike's Horses and Archetype retreat is life changing. I thank Kathy for revealing to me my true self, and feel incredibly blessed and thankful for this wonderful experience and the opportunities which it has allowed me to see in my present and future. "I came to your program mainly to be with the horses, creativity was secondary. I can tell you that after spending the weekend with you and the horses I tapped into a level or creative expression I had not experienced since was a child. This experience has freed me from my inner critic. I will continue with many of the tools and exercises you have taught me." "Kathy has been my coach for the past two years and it's hard to imagine how I would have survived a career change to coaching without her wisdom, support and encouragement. Kathy's coaching was just what I needed for supporting me where I was and I am grateful for walking the path with her." "The Dance of Authenticity workshop revealed to me just how powerful connecting with one’s authentic self and growing the skills to manage the false voice can be. It provided the opportunity to move beyond that one knows in one’s head to live from one’s heart." "Thank you for facilitating this great space last weekend. It had a profound effect on me, leading me to a place of experiencing my life more - experiencing my surroundings as mirror - rather than just seeing it. Thank you again."